Alan Pardew has rightly said today that this is a big week for the club, and we play Aston Villa in about four hours time, are at Gillingham in the Capital One Cup on Tuesday night, and then play Crystal Palace next Saturday at home, so three wins in those games will see Newcastle fans (absolutely) flying, but three defeats will see things not looking so good next Saturday night. There’s some definite optimism at Newcastle at the moment, which has been brought about by signing nine good players this summer – so far. And the way the club have handled the tragic deaths of dedicated fans John Alder and Liam Sweeney has been simply fantastic, and it has certainly helped bring the fans together – as we all start to realize what the important things are in life. It’s a test of Pardew’s management that he can navigate three games in a week – and as he says – if we get 4 points in the league and a win at Gillingham, that would be good. Getting three wins in a row would be even better – but we don’t want to get carried away either. Today’s game at Villa Park is crucial, and it looks on paper to be the most difficult game of the three – and a win today would be just what the doctor ordered. Note: Paul Lawson is a NUFC season ticket holder living in Birmingham, and wonders if there are any other season ticket holders in the area, so they can share the car expenses to Newcastle – you can contact Paul at 07969296054. How the hell would he know !!!!!!! PPB, well you can find your optimism from Alan’s career record if that makes you feel better you want. We may play well today with the new players looking fresh and patching over his limited management, or we also may not. rotonda —haha , how does he know ??????? did he dream it last night ??? also pards looks like hes going for the draw today , so i predict a 1-0 defeat. ilovetoon — may not be a bad thing ! 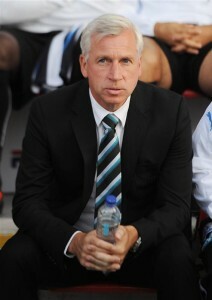 I sorry I couldn’t disagree more, Pardew job is safer than Mark Carney!!! We will find it tough today. Draw at best. We should be winning all three. That should be the aim and any less would be a disappointment. Yes we have lots of new players are adapting but Pards could instill a winning mentality to the players from the off and that any less is extremely disappointing. He drills that in them and more often than not they will fight to the end to ensure we win any match. We can win all three, hopefully Pards lets the new guys loose today and they’re up for it. Should be a good game today, can’t wait! SO PUMPED FOR THE MATCH TODAY! Im going for a 3-1 win. Cabella and de jong to get on the scoresheet. Abonglahor and weidman can could run rounds around willo and colo so im expecting workhorse colback to help out the defence alot and who knows maybe get a sneaky goal?